Steve Bannon, one of the most vocal of the many vile racists currently occupying the White House, has been fired by Donald Trump, head vile racist currently occupying the White House. This leaves him more time to further operate in a shadow capacity at right-wing clearinghouse Breitbart, and more free time to suckle on the sweet blood of baby fawns in the dead of night. Also, according to Axios, he “has told friends that he is ready to go ‘medieval’ on enemies of Trump and his populist agenda both in and out of the White House.” His position outside of it might make for more transparency as to Bannon’s overall agenda—which is, notoriously, “chaos” and nationalism—but that could also translate to an emboldened position within the resurgent white supremacist movement he helped create, so perhaps we should all celebrate with caution just yet. In Trump’s spitting-mad press conference on Tuesday, he defended Bannon as “not a racist,” but was ambiguous on his future in the White House. 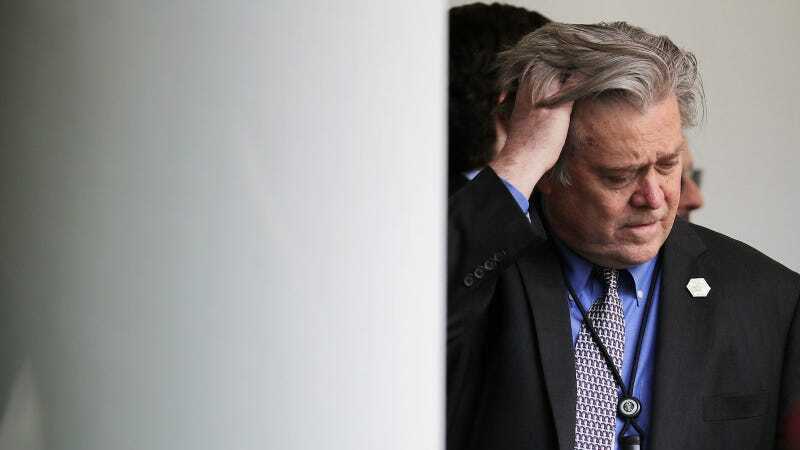 Bannon has, of course, been the presumed architect of some of the Trump Administration’s most racist policies thus far, most particularly the Muslim Ban, which has been of particular importance to his agenda since he took office. But according to the Times, Bannon had become simply too combative with rising Trump aides, including Gen. John Kelly, and is now on the street. See you in hell, you racist pustule!